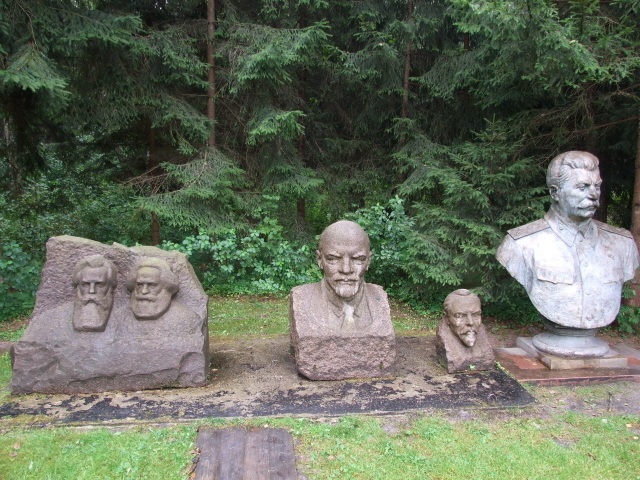 Grutas Park (or 'Gruto parkas' in Lithuanian), located in south-west Lithuania, is the world's most famous/infamous socialist sculpture park. 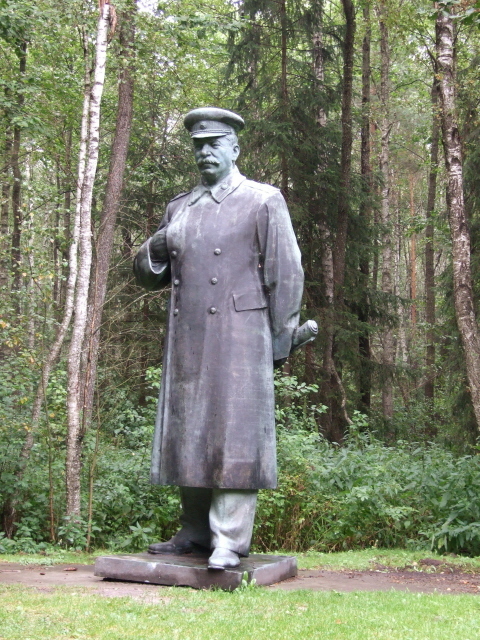 But it's more than that – a peculiar mix of a collection of socialist realist sculptures/statues (and yes, several Stalins are included), a complex of communism-era-themed museums, a children's playground and a mini-zoo plus a mock gulag-style landscaped park. Pretty unique in that combination. It's sometimes referred to in the press as 'Stalin World', but that's not its official designation, mind you! 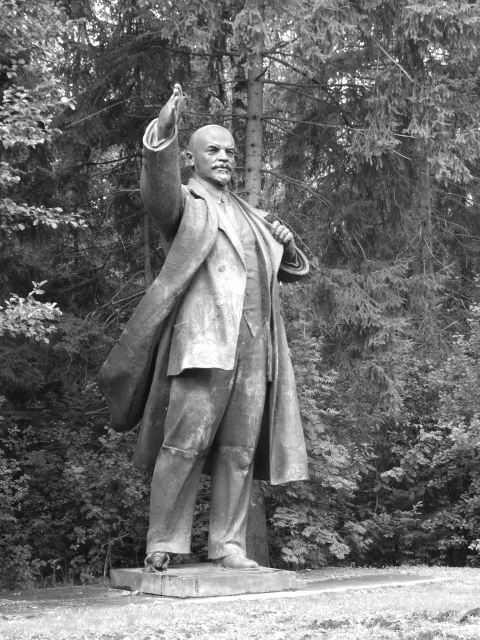 More background info: at the end of the Cold War with the break-up of the Eastern Bloc and the disbanding of the communist regimes in Eastern Europe, these countries were still left with the visible socialist legacy of all those statues and other sculptures that had been put up in most towns and cities. 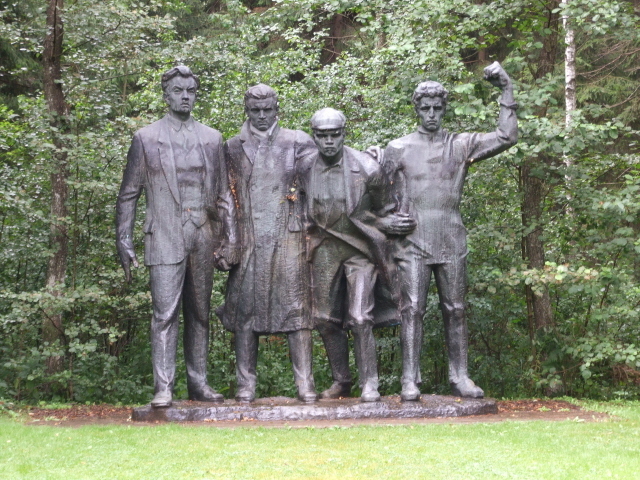 These socialist realist celebrations of the working classes or the Big Shot heroes such as Lenin, Marx & Engels, plus heads of the local leadership of course, were all suddenly sort-of redundant. What to do with them now, was the question. In most places the solution was rather radical: get rid of them. So too in post-Soviet Lithuania. The statues of the former biggies just disappeared, they were taken away and destroyed, or sometimes simply moved out of general view, e.g. into the suburbs (cf. 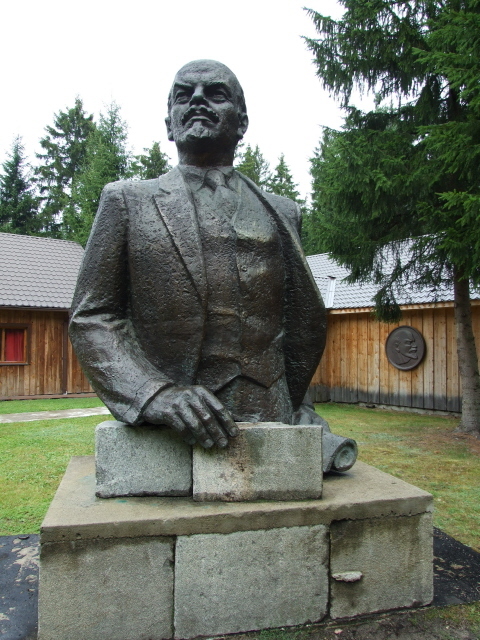 Budapest's Memento Park or the relocated Lenin-Marx-Engels triad in Chisenau, Moldova – see Transnistria). 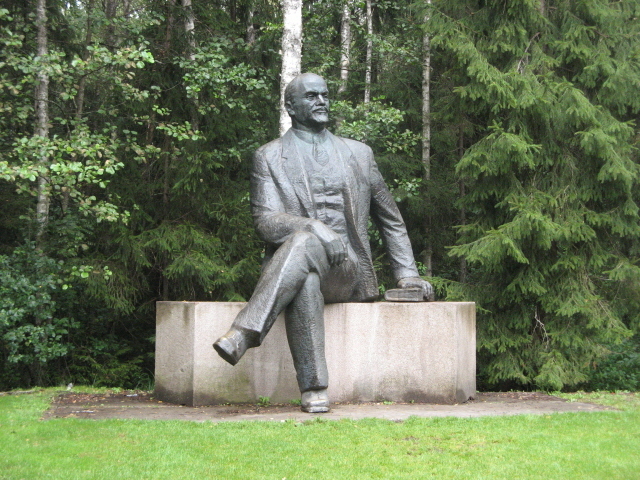 In Lithuania, which had become independent from the USSR in 1990/91, it was a private businessman and millionaire who had the idea of rescuing and collecting these unwanted works of art and putting them together on his estate in a remote corner of the country. They form the backbone of the theme park that is today Grutas Park. It's been controversial from the start, though. Some people find the theme park's approach tasteless or disrespectful to the victims of the former communist regimes. This is countered by the claim that the park serves as an educational reminder of those times, so that people don't forget what these dictatorships were and what they did. Granted, Grutas Park does try to live up to that claim, and does so especially well in the museum sections. However, there can also be no doubt about the fact that it certainly toys with controversy – esp. as far as the mock watchtowers, barbed wire and piped background music are concerned. Also, on certain days of the year (1st of April most notably!) Grutas Park comes alive, as it were, with actors, Stalin and Lenin look-alikes and mock parades. Whether these antics are genuinely of any great educational value can indeed be questioned. They are clearly more for fun. Nothing wrong with a bit of fun I'd say, but you can see why it may be going a bit too far for some people. There's also a copyright issue involved about royalties to the artists who originally created the statues now displayed at Grutas Park. 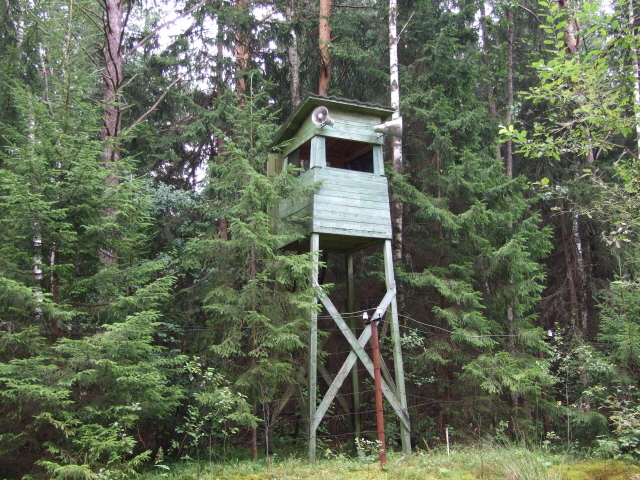 What there is to see: as you arrive at the car park and entrance, you're already greeted by a mock watchtower and barbed wire fence, together with mock border markers, one in Polish colours the other in Lithuanian colours. 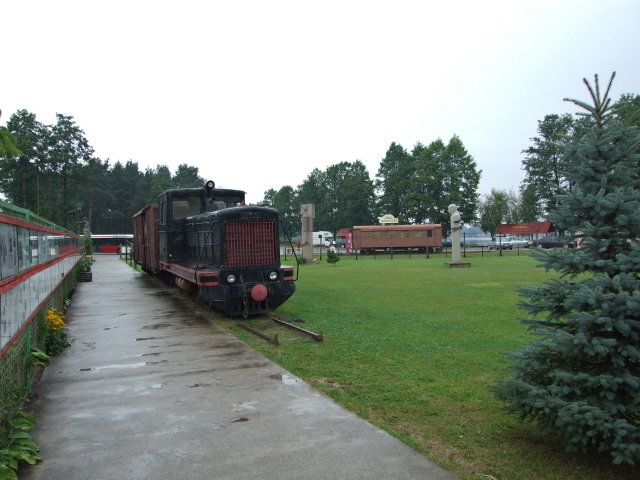 Past the ticket office is a short freight train – meant to evoke memories of deportations. Opposite along the path there's a whole wall of newspaper cuttings or reproductions of newspaper and magazine articles about Grutas Park, some quite frankly critical of the project. So they make no secret of the controversy surrounding the place. Next there's some unexpected bizarreness: animals such as a zebra and a kangaroo roam around in a pen opposite the first giant statue by a pond. You now enter the landscaped park part proper. To the right there are more animals, now in rather sorry small cages. To the left is the cafeteria and in front a large playground area, "decorated" with additional artillery guns and mortars. At the far end by the woodland stands a giant group sculpture of bronze partisans, the largest piece of the whole collection. 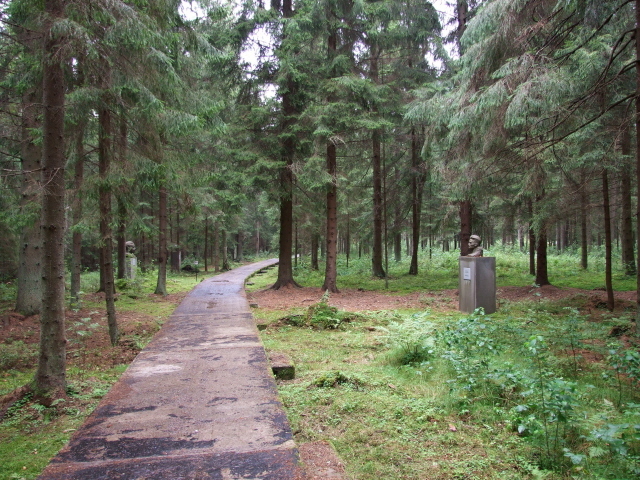 The rest of the sculpture collection is spread out along two loops of woodland walks. You get to meet all the usual suspects, including several Lenins, a few of impressive size, and also a number of Stalins. 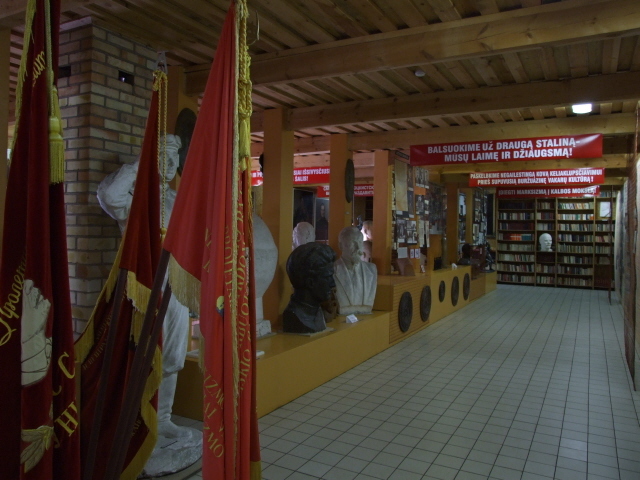 Mostly, though, there are rows of comparatively small busts, many of local communist VIPs whose names mean little to the foreign visitor. Plaques point out who is who – and also the original location (with pictures) they used to be in before their removal from 1990/91 onwards. Really striking, though, is the mock gulag set-up: this consists of rather flimsy looking barbed wire fences on the opposite bank of a river/moat by one side of the walkway, complete with watchtowers – and revolutionary music piped from loudspeakers affixed to those watchtowers. At this point the experience does get rather surreal. The museums, on the other hand, drag you back to reality – the past reality of the Soviet grip on Lithuania in particular. Reminder: the country had been absorbed by the Soviets during World War II and was a constituent part of the USSR. There are some text panels, also in English, but often the artefacts are left to speak for themselves. Some include original text, such as newspaper cuttings from those days, mostly in Lithuanian or Russian; so without the relevant linguistic skills the content will remain obscure to the foreign visitor, who can only guess the context from the accompanying pictures. The really dark parts of the Soviet era are also topicalized in parts of the exhibition – atrocities, deportation to labour camps, intimidation and persecution of intellectuals, and so on. The exhibition rarely gets very graphic though – probably better that way, as Grutas Park is clearly geared towards family outings too, not just towards die-hard dark tourists. At the end of the second woodland loop – now sans watchtowers and barbed wire, and with fewer international celeb commies on display – you get to a picture gallery. This has some truly glorious examples of socialist realism over-the-top-ness: huge oil paintings of factories with happily smoking chimney stacks, golden fields of wheat being admired by grateful party functionaries, an assortment of table-top tack such as little model MiG fighter planes, Vostok rockets or naval ships – as entertaining in its tackiness as it is reminiscent of that 'officially decreed' optimism and belief in communism's superiority. There are also three (!) 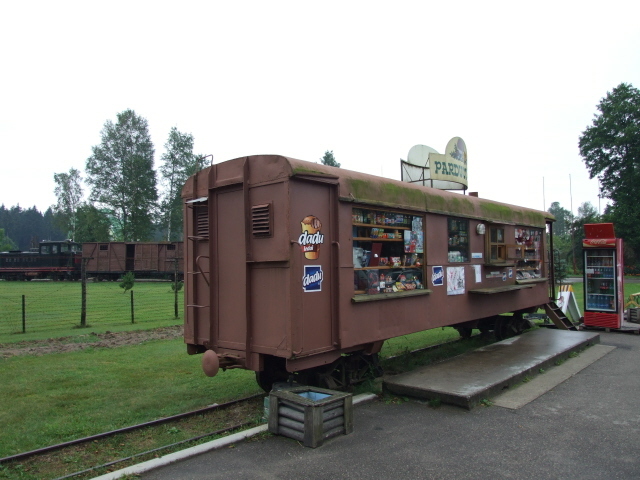 souvenir shops, one in the middle of the park, one by the entrance and one housed in another railway carriage in the car park. 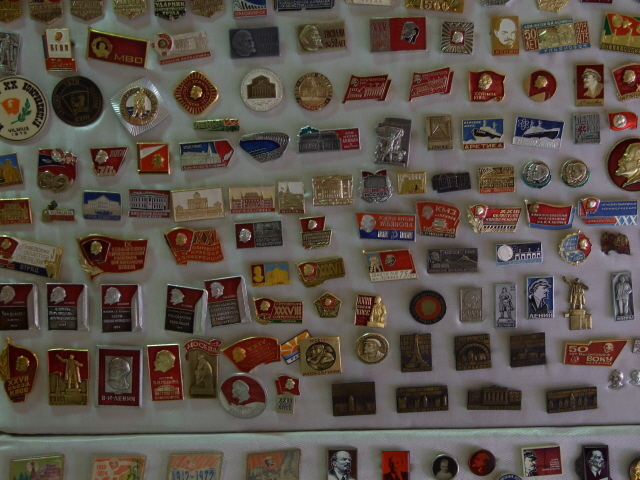 On sale are various communism-themed items such as coffee mugs, hip flasks, lighters with the Grutas Park logo, the tacky lot. I couldn't resist using up some of my remaining litas on the purchase of a hip flask with a classic Stalin portrait on it. The cafeteria on site also caters for communism nostalgia by serving up dishes such as "nostalgija bortsch" or "reminiscence starch jelly". You can even hire the place and have private parties catered for here in that style. 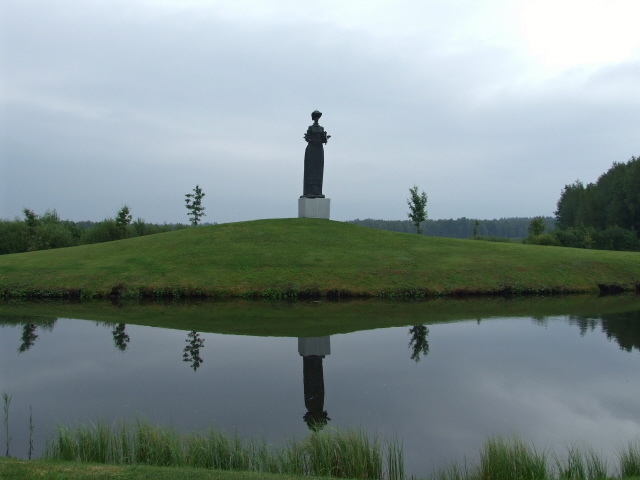 Location: in the south-western corner of Lithuania, near the town of Druskininkai, some 80 miles (130 km) from the country's capital Vilnius, and only a bit over 30 miles (50 km) from the now open border with Poland, and even closer to the (largely closed) border with Belarus. Access and costs: remote, not cheap, but still halfway moderate admission fee. Details: Getting there is by far the easiest by car – from eastern Poland, e.g. from the town of Augustow take the 16 road (from Suwalki first on the 653 via Sejny) towards the border crossing (no longer manned since Lithuania's accession to the EU and the Schengen Agreement) and onwards (road is now called 135) to Lazdijai. Turn right onto the 134, pass through Veisiejai and at Leipalingis turn into the 180 towards Druskininkai. The road takes you past the town and onto the intersection with the A4. Turn left (Vilnius direction) and a few minutes later you will see the signs for Grutas Park to the right. A small road past the lake takes you to the free car park at the entrance. From Vilnius simply take the A4 towards Druskininkai until you get to the signs for Grutas Park. From Vilnius you could also get the scheduled bus service to Druskininkai, ask to be let out at the Grutas stop, from where it is a few miles' walk along Parkos street by the lake. Or get the bus No. 2 from Druskininkai (via Vieciunai), which is however rather infrequent (only two to four times a day, so exact timing is essential!). Admission to the Park is 7.50 EUR (some concessions apply), free for children under 6. Those who are really keen can hire an audio guide for 13.30 EUR, which points out all the stories behind the various statues, busts and sculptures (if you need to know all that …). Time required: walking around and visiting the museums/exhibitions takes about two hours, unless you know Lithuanian and/or Russian and can/want to read more of the original texts, or if you're using one of those audio guides, or if you want to visit the cafeteria too, in which case you should allow more time accordingly. Getting to Grutas Park is likely to take a good amount of time by whatever means of transport, so it's best to plan the visit at least as a half-day trip. Combinations with other dark destinations: nothing nearby, but Vilnius has its dark sights/sides. 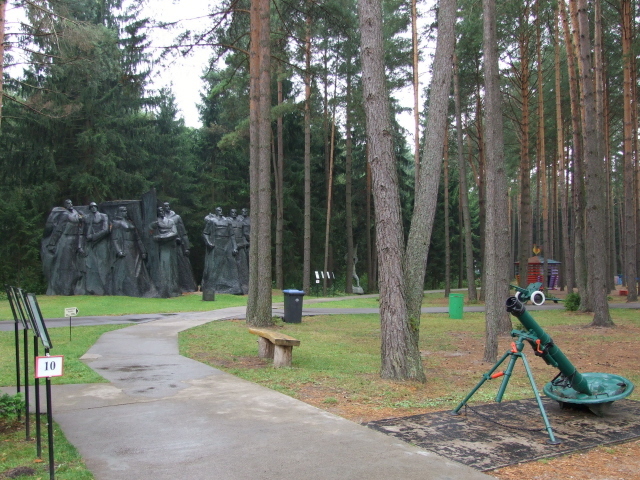 Neighbouring Poland has loads to offer the dark tourist, of course, although few of the truly dark sites are in that north-eastern part of the country. The closest of the major dark sites would be the Wolfschanze ('Wolf's Lair') bunkers at Gierloz in Masuria, which could only be combined with a visit to Grutas Park if you allow a stopover or two with accommodation en route, e.g. at Suwalki, which also has a couple of dark-ish sights. When driving from/to Suwalki, just outside Lazdijai off the 134 you'll pass a Lithuanian sign on which you can make out the word 'genocide'. If you follow that it's about a 10 min. drive, with further signposting, now also in English, which ends in a field, basically, just outside a small memorial garden. 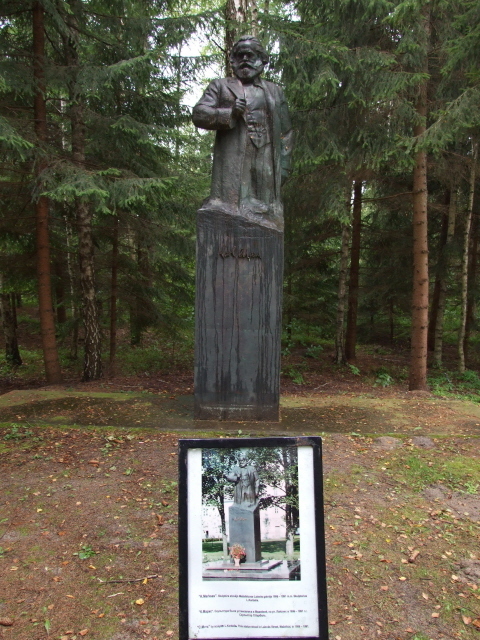 There's not much to see in it – but it's one of many such sites in this part of the world where today only modest monuments mark the place of mass murders that happened all over the area during World War II. In this case it marks the murder by the 'Einsatzgruppen' of 1535 Jews from Lazdijai on 3 November 1941. As the site is en route it may well be worth a short stop for contemplation. Combinations with non-dark destinations: The area around Grutas is quite pretty, especially the lake that the park is located next to. This part of Lithuania used to be a spa area too, and to a degree still is. It's quite an empty part of the countryside, which has a charm of its own. Neighbouring Poland has more touristy bits to offer – in particular the picturesque environs of the Augustow Canal, and the pretty holiday town of Augustow itself. The nearby regional capital Suwalki is less developed in a tourist way, but is close to the beautiful Wigry National Park.